Watering infrequently. Deep watering in the early morning will help the turfgrass establish adequate roots and provide sufficient moisture between waterings. 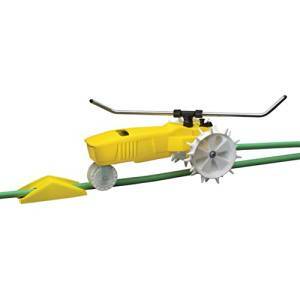 To determine when to water, probe the soil with a screw driver or a probe that removes a core of soil at least four to six inches below the surface. Water deeply. When watering does take place, the object should be to moisten the soil to a depth of at least four to six inches. This will cause the plant roots to sink deeper, seeking the reservoir of moisture. Deeper-rooted plants will survive dryer conditions. Water thoroughly. It requires a 1 inch of water to wet the soil four to six inches deep. To achieve this it will require approximately 45 minutes of watering. The best time of day to water is early morning because there is typically less wind and to reduce problems associated with disease. 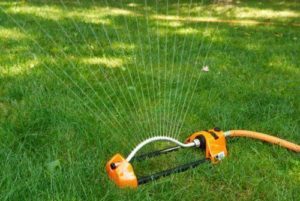 Irrigation is the best method for ensuring the turfgrass seedlings will receive an adequate supply of water for establishment. Therefore, diligence is extremely important in keeping the soil surface moist. The following five tips will help to ensure a successful establishment. Consider frequency rather than duration. Frequent, light irrigation cycles provide more consistently available water to the turfgrass. Avoid wetting-and-drying cycles. Not only does this delay germination, but it reduces the germination rate. Make sure the seedbed is moist late in the day. Doing so typically ensures water is available for many hours, because night time evaporation is low. Continue consistent watering even after germination occurs. Watering is important to young roots and developing leaf structures. Follow through with your watering. Assuming the pressure to water is off once the seedlings appear, and slacking off your duty to supply water, is an approach doomed to failure. By depriving the seedling of adequate water, you’re likely to lose many to permanent wilting.